Ziad Ahmed is a practicing Muslim and self-proclaimed "unapologetic progressive activist"
Ziad Ahmed, an East Coast student and activist, was accepted to Stanford after writing "#BlackLivesMatter" 100 times on his college application. One hashtag repeated 100 times on a college application was good enough to help an East Coast student earn an acceptance letter from Stanford University. When confronted with the question "What matters to you, and why?" Ziad Ahmed of New Jersey responded by writing "#BlackLivesMatter" exactly 100 times. He took to Twitter on Saturday to announce his acceptance to the Peninsula-based university. Ahmed, a practicing Muslim and self-proclaimed "unapologetic progressive activist," was proud of his academic prowess and extracurricular accolades heading into the essay process, but he was concerned about not being able to highlight his voice and passion. "It was important to me that the admissions officers literally hear my impatience for justice and the significance of this issue," he wrote in an email. 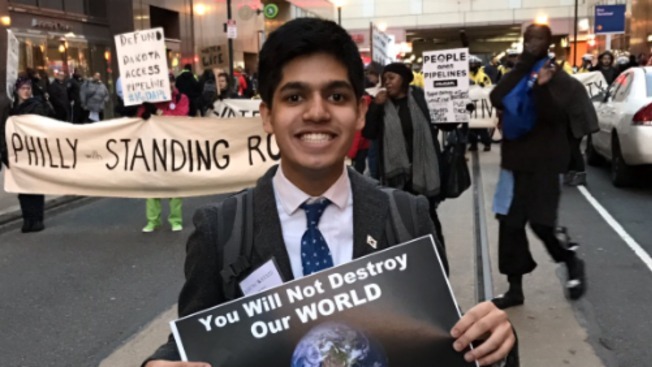 Repeating three words several times on a college application to a prestigious institution was an admittedly risky choice for Ahmed, but he was willing to take a shot in order to fight for justice first as opposed to his academic future. "I wanted to convey not only my passion by taking the unconventional risk but also by demonstrating how my words represent my willingness to stand in solidarity with the courageous women of color leading this vital movement and those resisting everyday," he wrote. Ahmed's answer clearly got to the point, but it also lacked a response to the question of "why." He responded to that deficiency. "When I thought about why, I realized that the insistence on explaining the meaning of the hashtag is inherently problematic and the 'why' is embodied in the words themselves," Ahmed wrote. "Declaring the humanity and value of black lives is necessitated by the painful reality that the collective humanity is denied every time perpetrators of violence enjoy impunity by a system of justice that prevents accountability." What the future holds for the high school student is up in the air. He has been accepted to Yale, Princeton and others. Regardless of his final school of choice, Ahmed wishes that his spot in the limelight sparks change. "It is my hope that this attention encourages and motivates people to confront the impunity and inequity that we see today," he wrote. Stanford did not comment about the case because the university does not comment on student applications.